« Blues Master Wily Bo Walker & New York’s Danny Flam top the download charts?!! A couple of weeks ago Erin sent me this article in the New Yorker about a Marsalis CD in production. I was delighted to see some familiar names mentioned, and that Andy Farber was conducting the music on the CD. I have to admit though that I only l i g h t l y skimmed the article the first and on the second times around I saw Andy Farber’s name. Long story short, a phone call to Maestro Farber pointed me in the direction of ticketmaster.com. It was only after I had decided to buy tickets that I discovered we had GREAT seats to see not just a jazz concert, but a new silent film accompanied by Wynton Marsalis, pianist Cecile Licad and a 10-piece all-star jazz ensemble at New York’s famous Apollo Theater. Fantastic! Shot by Academy Award-winning cinematographer Vilmos Zsigmond (Deliverance & The Deer Hunter) ‘Louis’ is a semi-fictionalized account of a young Louis Armstrong and his first cornet. It stars a wonderful young actor named Anthony Coleman, who was in the audience that night. Wynton Marsalis led the all-star jazz ensemble, which included some of New York’s finest musicians such as Marcus Printup, Ted Nash, Kurt Bacher, Vincent Gardner, Wycliffe Gordon and Dan Nimme. The awesome percussionist Arnie Kinsella, Jr. was back there looking like a a Manhattan Project physicist doing his thing – gotta love it. 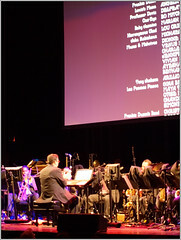 This top-notch group filled the Apollo Theater with music from 19th century American composer L.M. 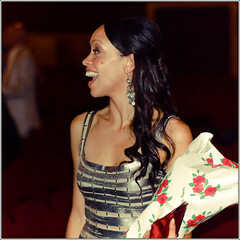 Gottschalk and pieces written by Marsalis especially for this production. 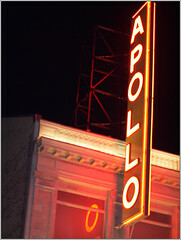 The Apollo. Louis Armstrong. Wynton Marsalis – what could be more Jazz than that? Maybe if we were magically transported to 1901 New Orleans. Many of you already knows the legendary theater where Ella Fitzgerald, Billie Holiday, Marvin Gaye and Sarah Vaughan started their careers. If you are from overseas or you were stuck in a cave for the past 70 years, know that long before “American Idol” and “America’s got talent” there was “Showtime at the Appolo”. Walking into the Appolo makes you feel special. Drum roll … as we walked into the Apollo, we were star struck! I don’t remember ever having seen a live orchestra accompanying a silent film. Sure, I had seen Chaplain movies on the big screen, and documentaries and biopics of Harold Lloyd, but never a full length film with the intended musical accompaniment. Of course, calling it a silent film is a slight misnomer because the theater was anything but silent. Keeping in time with the Marsalis ensemble (conducted masterfully by Maestro Farber), the audience cheered for Satchmo’s dreams of playing the cornet and for his heroism toward the young mother named Grace, played by Shanti Lowry. There are a few reviews comparing the look and feel of ‘Louis’ to the Spielberg-esque Schindler’s List washed-out cinema-scope, and I have to say that thought came to my mind as well. In the case of ‘Louis’ however, there is no unyielding ennui, or terrorism or Nazis. In fact, I seriously doubt there could be a happier movie about an impoverished, fatherless 6-year old in in turn-of-the-century New Orleans. ‘Louis’ was written in part by Hyatt Hotels heir/filmmaker Dan Pritzker, who reportedly invested millions of his own dollars into the production. What else is there to say except, good for him! As the credits rolled we met up with producer and engineer Jeff “The Jedi Master” Jones. Jedi is involved in the ‘Louis’ soundtrack production and rode his bike to the theater as he lives just a few blocks away. His first interest in music was listening to Armstrong, so this night was for him a passion come full circle. He confirmed for Erin that the Harlem Wishing Tree stump was indeed back stage, but he had declined to touch it out of respect for America’s next great musical discovery. Incidentally, our own Kenny Rampton who played on the CD recording, was away, headlining the Edinburgh International Festival concert. My understanding is that the soundtrack is to be released at some time in the near future. I am sure this will be at least nominated for best soundtrack of the year. This entry was posted on Friday, September 3rd, 2010 at 3:45 pm	and is filed under Stuff. You can follow any responses to this entry through the RSS 2.0 feed. You can leave a response, or trackback from your own site.